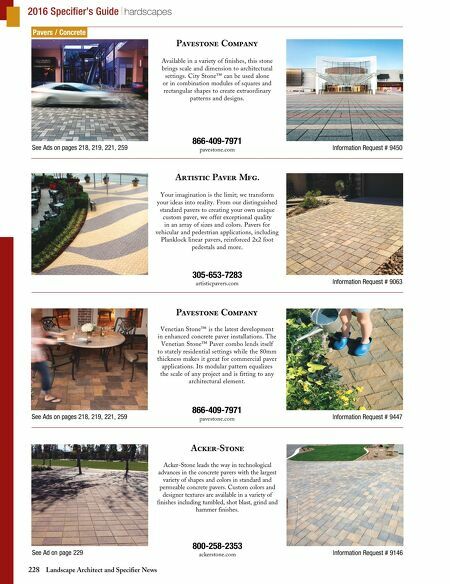 228 Landscape Architect and Specifier News 2016 Specifier's Guide hardscapes Pavers / Concrete See Ads on pages 218, 219, 221, 259 Information Request # 9450 Pavestone Company 866-409-7971 pavestone.com Available in a variety of finishes, this stone brings scale and dimension to architectural settings. City Stone™ can be used alone or in combination modules of squares and rectangular shapes to create extraordinary patterns and designs. Information Request # 9063 Artistic Paver Mfg. 305-653-7283 artisticpavers.com Your imagination is the limit; we transform your ideas into reality. From our distinguished standard pavers to creating your own unique custom paver, we offer exceptional quality in an array of sizes and colors. Pavers for vehicular and pedestrian applications, including Planklock linear pavers, reinforced 2x2 foot pedestals and more. See Ads on pages 218, 219, 221, 259 Information Request # 9447 Pavestone Company 866-409-7971 pavestone.com Venetian Stone™ is the latest development in enhanced concrete paver installations. The Venetian Stone™ Paver combo lends itself to stately residential settings while the 80mm thickness makes it great for commercial paver applications. Its modular pattern equalizes the scale of any project and is fitting to any architectural element. 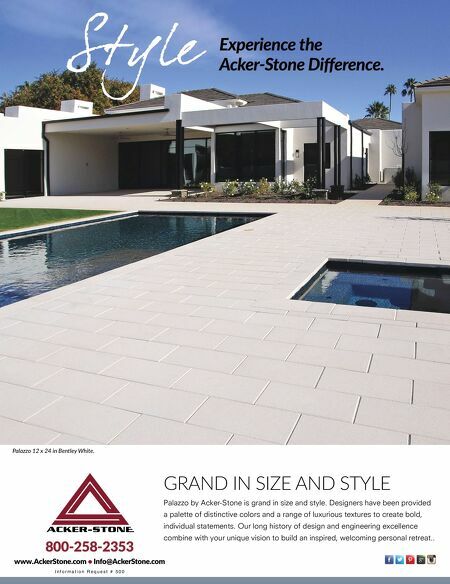 See Ad on page 229 Information Request # 9146 Acker-Stone 800-258-2353 ackerstone.com Acker-Stone leads the way in technological advances in the concrete pavers with the largest variety of shapes and colors in standard and permeable concrete pavers. Custom colors and designer textures are available in a variety of finishes including tumbled, shot blast, grind and hammer finishes.